All the books in this collection are being continuously updated. When you order a copy you will be receiving the latest version. A reclassification.New York, U.S.A. 50 pages. The machines chronologically arranged. 60 pages. And some cameras made by SIEGMUND LUBIN. 1896-1916. A checklist. As I have often said that when one owns a “thing” it is so difficult to be objective when all the facts surrounding it are not there. We think it is more important, older and rarer then it may actually be. 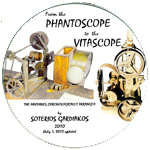 I went back through my archives and there it was a simple paragraph written by C. Francis Jenkins himself in the October 1920 in the Transactions of the SMPE journal: “My own contribution to this line was a Phantoscope toy (U.S. Patent No. 779,364, 1905) in which a flexible band was employed, the card being attached thereto by their lower ends and having a spaced relation of about five thousands inch. This close spacing of the cards assured a firm adhesion to the band and to each other.” There, we now have a date of 1904 for the patent application and a date of 1905 for the granting of the patent. Mystery solved. All the information I have found is included in this 21 pp book. 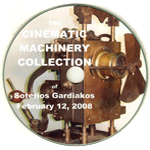 When in 2001 my good friend George Panagiotides called me from Athens to tell me that he had found an unusual movie projector for me at Monastiraki (Athens flea market) little did I realize that I would soon possess the earliest known Greek projector. 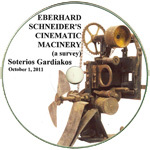 I than contacted Greece’s foremost authority on the Greek cinema, Nikos Theodosiou, to inquire if he had any knowledge on this projector, He had none. But it started a long discussion on Greek made cinematic equipment, and freely provided me with information that he had been gathering for many years. The result is this first attempt to compile a list of Greek made cinematic equipment. The Edison Kinetoscope peephole machine ushered in the movie age. This the machine that first introduced the 35 mm perforated film that is still the standard in projecting living pictures today. Imitators followed and this book compiles all such machines that shaped the movie industry we know today. Jean Acme LeRoy is one of those early pioneers of the cinema whose fame has risen and than waned like the wind. He claims to have invented and to have made the very first “Living Pictures” projector, although this has never been substantiated, he still lurks in the back ground. 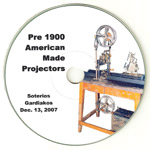 He did however manufacture a substantial projector, possibly one of the very best, known as the “Acme” but due to its high cost did not succeed in the market place. 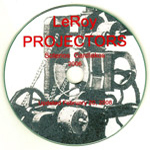 In this book are collected all scanty information available on LeRoy, his life and his machines. 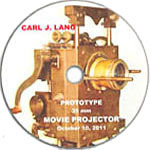 The proliferation of movie projectors from the first public showing of animated pictures is little documented as far as American made projectors are concerned. This is the first attempt to gather this disbursed information in one book. 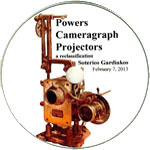 Over 75 different motion projectors are listed in this book with most being illustrated. Many more were probably made as can be attested in Jenkins book, published in 1898, listing over 100 “scope” and “graph” machines. 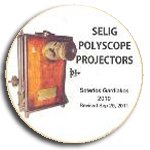 When Thomas Edison introduced his Projecting Kinetoscope in late 1896, although it was not shown to the public until early 1897, Kodak and the other film manufacturing companies were not able to produce 35 mm celluloid film greater than 50 feet in length. As this was of very short duration time Edison decided to use a continuous loop system similar to his “Peephole Kinetoscope”, others soon imitated him. 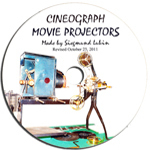 This book attempts to list and illustrate all such machine made at the dawn of cinema. 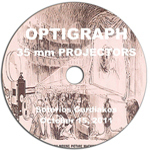 The Optigraph eries of projectors is one of the more interesting early 35 mm machines for one to collect. Their diminutive size makes them collectible even for those collectors with very limited space. Learn all about these fascinating machines in this free book! 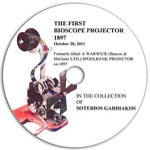 Every collector of English projectors knows that the Bioscope is a particularly popular name in England and the British Commonwealth. From England to South Africa to India when one wants to go to the theatre they will say “let’s go to the Bioscope”. 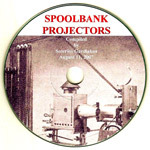 The reason being that Charles Urban, an American, made movie projectors in England, called “Bioscopes” that were very successful and were imitated by many others. 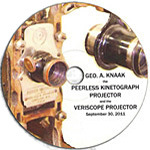 What most do no know is that the very first bioscope was made by Walter L. Issacs of New York City by and for Charles Urban for the American Market. This is an interesting search by the author to find the origins of this bioscope in his collection and until finally vindicated by John Barnes.